To avoid a flooded basement, damaged foundations and other serious or potentially very costly problems, your home's gutter system has to work well. You may think your gutters run parallel to the roofline of your house, but they're actually slightly sloped to ensure adequate drainage into the downspout. Problems are inevitable when gutters are level or sloped incorrectly. Take the time to get your gutter slope right, and you'll have peace of mind that every drop of rainwater is going exactly where it should. The gutter slope, also called the pitch, is the amount the gutter tilts down to let rainwater flow out of it. If gutters don't slope, water gathers in them. The amount of collected water increases until it spills over the sides of the gutter. If gutters slope too severely, they don't hold water, and water could splash over the sides in heavy rain. All guttering must tilt toward the closest downspout. If you have a long roofline, over 30 feet, have a downspout at either end, and slope the gutter toward either end from the center. For example, if your roofline is 60 feet long, create a 3/4-inch slope from the center of the roofline to either end. Also, water doesn't naturally navigate corners well, so install a downspout whenever the roofline curves. 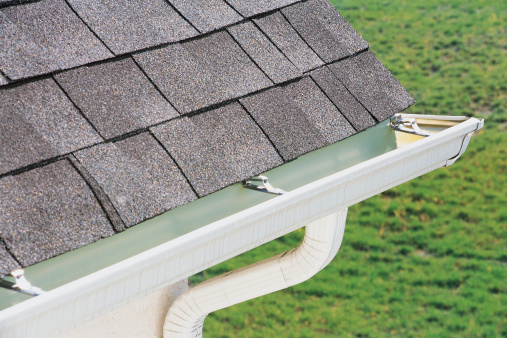 As a general rule, gutter slope is set at 1/4-inch per 10 feet of guttering. For example, if you have 30 feet of guttering, the calculation is 1/4 x 3 = 0.75, i.e. 3/4-inch. This means the downspout end of the gutter should be set 3/4 of an inch lower than the other end. To calculate gutter slope, attach one end of a long piece of string to the highest point of your gutter and the other end at the location of your downspout. Use a string level to ensure the string is completely parallel to the ground. Measure the length of the string to determine the distance between the two points. If you have 30 feet of guttering, as above, you know the slope should be 3/4 of an inch. Take the downspout end of the string, lower it 3/4 of an inch, and reattach it. Mark both ends of the string with a pencil then remove it. Snap a chalk line from these two marks to determine the line your gutters will follow. Repeat this process for all gutters around your roofline.